Mycenae "Rich in Gold", the kingdom of mythical Agamemnon, first sung by Homer in his epics, is the most important and richest palatial centre of the Late Bronze Age in Greece. Perseus, son of Zeus and Dana, daughter of Akrisios, king of Argos and descendant of Danaos, is traditionally considered as its mythical founder. According to the myth, Perseus's descendants reigned at Mycenae for three generations. After the last of them, Eurystheas, died childless, the Mycenaeans chose Atreus, son of Pelops, father of Agamemnon and Menelaos, as their king (see also Homer's Iliad). 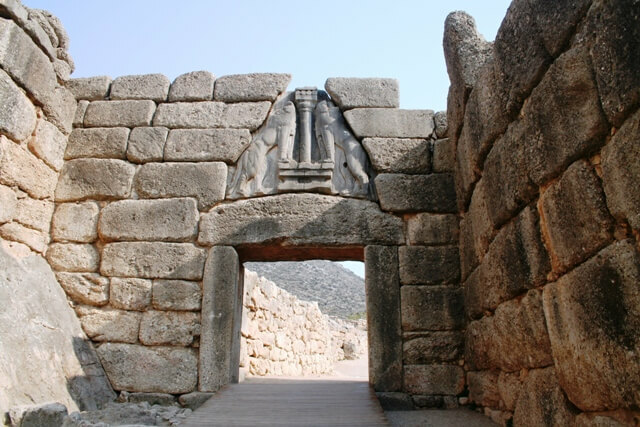 Mycenae is one of the most important archaeological sites of Greece. The fortified citadel is nested over the fertile plain of Argolis near the seashore in the northeast Peloponnese. 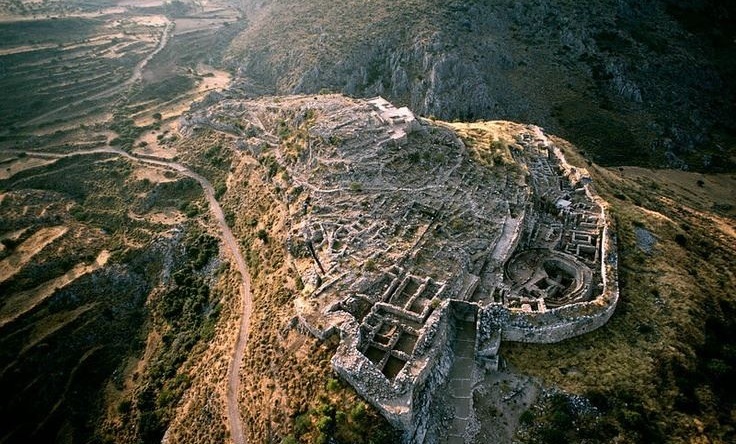 Mycenae is the largest and most important center of the civilization that was named "Mycenaean" after this very citadel. Mycenaean is the culture that dominated mainland Greece, the Aegean islands, and the shores of Asia Minor during the late Bronze Age era (circa 1600-1100 BCE). The Mycenaean Era occupies the tail end of the Helladic Civilization, which flourished in mainland Greece since 3000 BCE. The Mycenaeans used a syllabic script that is the earliest form of Greek, attesting to the continuity of the Greek civilization from the early Bronze Age era. Many archaeological sites, cemeteries, and Tholos Tombs of the era have been unearthed throughout Greece, and the discovered artifacts speak of a people with strong cultural presence, a centralized political system with a King at the top, with strong commercial ties to the rest of the Bronze Age Mediterranean centers, and a militaristic attitude. Their extensive contact with the mainland Helladic and Mediterranean cultures (Minoan, Cycladic, and Levantine) enriched their existence and allowed for the development of a unique cultural identity that's evident in their legends, art, and architecture. Archaeological and tablet evidence indicates that the Mycenaeans dominated the area around the Aegean sea and assimilated the diverse amalgam of local people into a homogeneous culture from the Levant to Sicily and northern Africa. Their influence and power is most evident in the magestic citadels and palaces, in the grand royal burials, and in the extraordinary grave goods that included luxurious jewelry, weapons, and vessels of all kinds. The vast majority of the funerary artifacts unearthed (beginning with Heinrich Schliemann's excavations on the site) are made of precious metals, such as gold, silver, and bronze, as well as precious stones and crystals like lapis lazuli which originated in central Asia. They traded mainly oil and ceramic vessels and imported "Anatolian or Caucasian tin and Syrian ivory" (Vermeule, 255). They also manufactured and traded weapons and tools with the raw materials they imported, and there are indications that they were involved in mercenary wars and even piracy. Mycenaean artistic output is generally characterized by an austerity of decoration, symmetrical composition, repetition, and disciplined formal arrangement, with limited subject matter that depicts mostly nature, hunting, and war scenes. The sculpture can be safely considered "crude" in execution, consisting mostly of low relief stone carvings, but the craftsmanship of their decorative arts is exceptional. In terms of written records, Mycenaeans have left us with countless Linear B which almost exclusively contain catalogues and official records of a very stout bureaucracy which itself denotes a complex political and economic organization that was uniform throughout their area of influence. The end of the Mycenaean civilization came in 1200 BCE and lingered until the middle of the 11th c. BCE. The causes of this end have been debated for the last two centuries, and while several theories have emerged as dominant, no definitive answer has emerged to date. Among the most credible theories is the emigration of Dorians and Heraclids (Tribes that lived hitherto in central Greece) which destroyed all the Mycenaean centers - except Athens -, and the hypothesis that social upheaval from within forced the civilization into decline. The Sea People that decimated the shores of the eastern Mediterranean at that time are also credited with direct or indirect involvement in the demise of Mycenaean civilization, with some scolars indicating that the Sea People might have been Mycenaeans forced to flee their invaded homeland. Naturally, a combination of the above theories has also been suggested as the cause for the disappearance of the Mycenaeans. No matter what the cause, the effects of this rapid decline were devastating and resulted in what we consider to be the Greek Dark Ages when population declined dramatically, major cities ceased to exist, and literacy disappeared for the next three hundred years. Many of the legends of Ancient Greece have their origin, and refer to the this late Bronze Age Era we call "Mycenaean". The founding of Mycenae is lost in prehistory, but according to Greek legends, it was founded by the legendary hero Perseus - son of Zeus and Danae, daughter of the king of Argos, Acricios - who left Argos for Tyrins and later employed Cyclopes to build the walls of Mycenae with giant stones that no human could move (thus the characterization of the walls as "Cyclopean"). The Perseid dynasty ruled the area from Mycenae from at least three generations. Eurystheus, the last of the line, was the one who commissioned Herakles (Hercules) to perform his twelve labors, and when he was killed fighting the Athenians, Atreus, the son of Pelops became the king of Mycenae and started the Atreid dynasty. Atreus' son, Agamemnon led the expedition against Troy - the story immortalized in the Homeric Illiad - but was murdered by his wife Clytemnestra upon his return to Mycenae. There are several explanations about how the place took it's name. Homer indicates that it is named after a beautiful nymph called Mycene, while other theories credit the mushroom-shaped pommel of Perseus' sword, or the local mushroom (mykes) he used as a cup to drink water on the site where the Perseia spring spontaneously appeared.